Featuring exercise problems at the end of each chapter, Introduction to Optical Metrology provides an applied understanding of essential optical measurement concepts, techniques, and procedures. Rajpal S. Sirohi, Ph.D, is currently chair professor of the Physics Department at Tezpur University, India, and senior editor of Optical Engineering. Previously, he was director of the Indian Institute of Technology Delhi; vice-chancellor of Barkatullah University, Bhopal; vice-chancellor of Shobhit University, Meerut; and vice-chancellor of Amity University, Jaipur. He also served in various capacities at the Indian Institute of Science, Bangalore; Indian Institute of Technology Madras, Chennai; Case Western Reserve University, Cleveland, Ohio, USA; Rose-Hulman Institute of Technology, Terre Haute, Indiana, USA; Institute for Advanced Studies, University of Malaya, Malaysia; University of Namibia; National University of Singapore; and École Polytechnique Fédérale de Lausanne, Switzerland. Widely published and highly decorated, Professor Sirohi is or has been a fellow, honorary fellow, invited fellow, member, board member, and former president of numerous scientific academies, associations, committees, societies, and journals. "A good book for students and professionals to learn both basic and practical aspects of optical metrology." 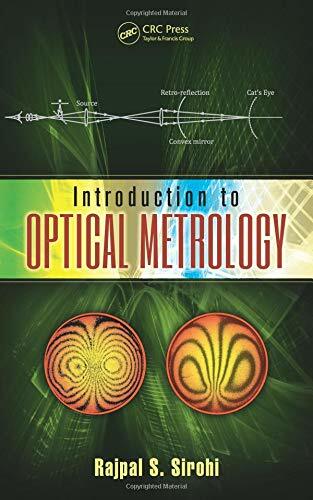 "The theory and practice of optical metrology is equally weighted in this book, an ideal combination for the instructor, student, and researcher." "The author’s way of writing/explaining is very well adapted to students and practical-thinking persons. The didactics show the long experience of the author."